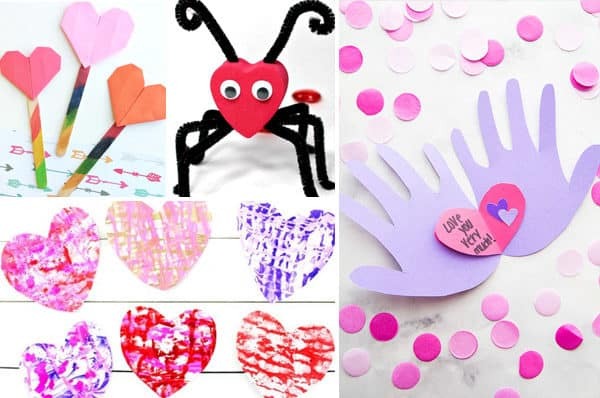 Valentine’s Day is a popular crafty theme for this month, but there are lots of other awesome February crafts for kids to make. Our list of February crafts for kids includes lots of Valentines crafts, some adorable polar bear and groundhog day crafts, fun Chinese/Luna New Year crafts, and lots more. Here are February Crafts for kids of all ages covering so much more than just Valentines Day! 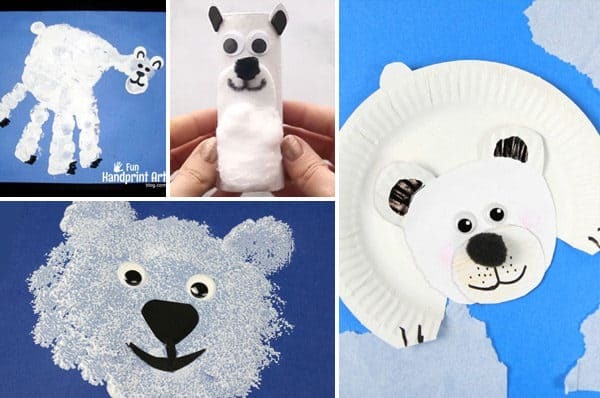 You will love these super creative and unique crafts covering polar bears, groundhog day crafts, fun Chinese/Luna New Year crafts, and lots more. You will find more than enough craft ideas on this list for you to do a new craft every day of the month. 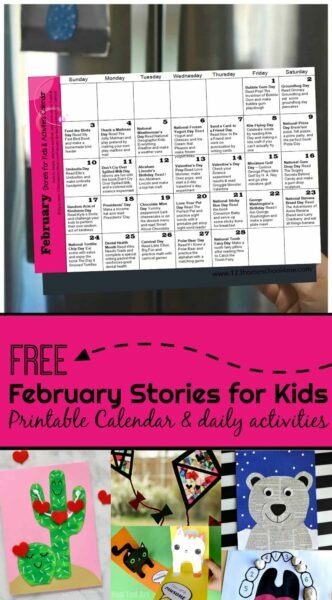 So have fun celebrating February with all these awesome kids crafts! Paper plate dragon twirler from Red Ted Art. These twirling dragons would look so great hanging up to celebrate Chinese new year. Cupcake liner dragon craft from I Heart Crafty Things. 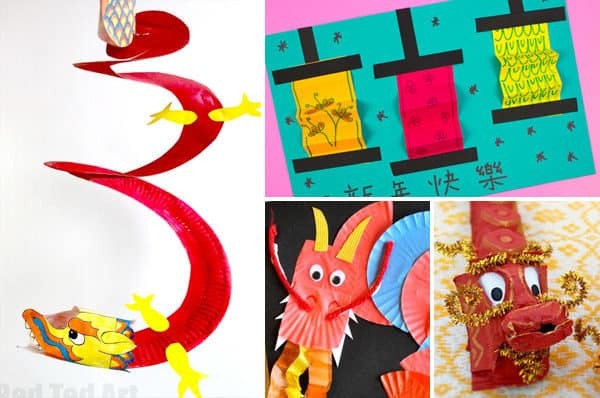 This another bright and fiery dragon craft to celebrate Luna New year. Chinese New Year folded lantern craft from Pink Stripey Socks. These gorgeous folded lanterns are a great craft for little hands to try out. Egg carton dragons from Creating Creatives. These little good luck dragons are the cutest! DIY lucky red envelopes from Thrifty Jinxy. There is a great free printable template with this post so you can make your own lucky red envelopes to give for luna new year. Painted paper fans from Picky Stripey Socks. Make a gorgeous fan, there is even a dragon design you and print and turn into a fan. Origami heart bookmark from That Kids Craft Site. There is step by step instructions to make this easy origami heart into a bookmark. Valentines live bugs craft from Rhythms of Play. How cute are these little love bugs?!? Printable Heart Fish Craft is a fun-to-make craft that only requires kids to cut and paste to make beautiful Valentines Day fish. This is great for a school bulletin board! Cute paper heart Valentines craft from One Creative Mommy. I love that you can turn this craft into a hanging, a chain/ or even a wreath! Handprint Valentines craft from The Best Ideas for Kids. This gorgeous craft would make a lovely Valentines gift. Valentines Day Math Craft is a clever way for kids to practice addition while making a cute heart cupcake! Shaving cream heart art from Natural Beach Living. Even little ones can join in with this fun process art activity. Heart spin paintings from Projects With Kids. This an easy but super cool art technique to try out. Heart buddies – easy Valentine’s day craft from Buggy and Buddy. These little guys are so cute, and they’d make great gifts for friends. Finger Painted Valentines Day Tree Craft is as fun to make as it is beautiful! Cute Printable Cactus Craft – Looking for a super cute craft that doesn’t require a lot of prep, supplies, mess, or clean-up? You will love this printable cactus craft! Paper plate groundhog craft from ADab of Glue Will Do. I love this little groundhog’s happy smiling face! Groundhog day mask craft from I Heart Crafty Things. Make this cute mask and dress up as a groundhog! Groundhog puppet craft from Typically Simple. Make this adorable groundhog pop up out of his burrow! Paper bag groundhog craft from Glued to my Crafts. 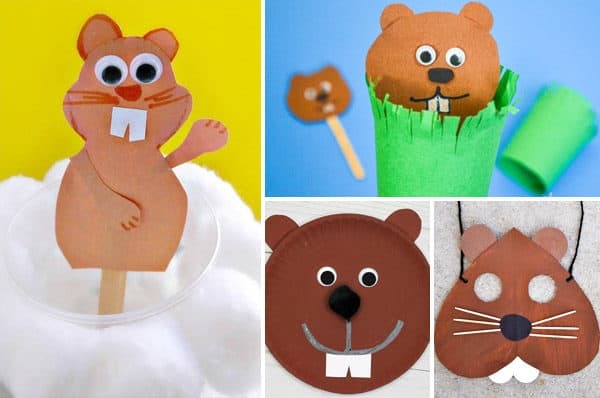 You could use this adorable groundhog as a puppet or make a fun wall display. Simple groundhog day craft from Easy Peasy and Fun. Here’s another cute groundhog that pops up! Polar bear puppet craft from Kids Craft Room. There is a free printable pattern to help you make this cute polar bear. Winter toilet paper roll animals from The Best Ideas for Kids. There is a cute polar bear to make, as well as a penguin and some other winter animals. Handprint polar bear from Fun Handprint Art. These handprint polar bears would look adorable up on the wall. Pom pom printed polar bear craft from Crafts on Sea. This is a great activity for little hands to try. Polar bear craft from A Dab of Glue Will Do. This is a fun paper play craft to try. Random acts of kindness printable notes from Gluesticks. 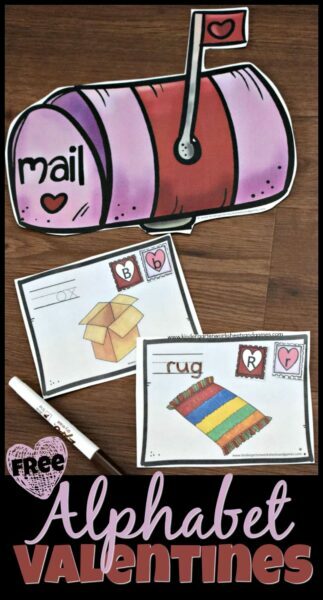 Random Acts of Kindness day is February 17th, and this is an easy and fun craft to spread some RAK love with your kids. 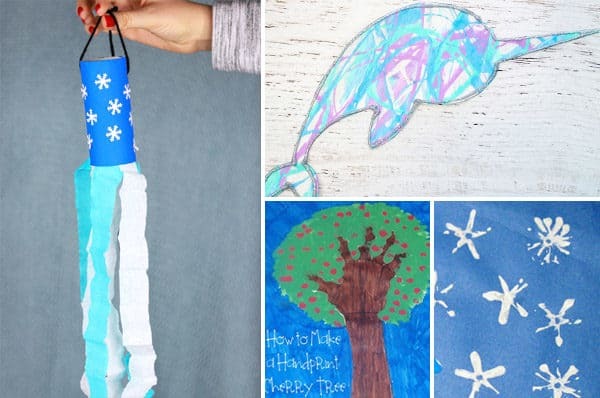 Winter windsock craft from Easy Peasy and Fun. Find out how windy winter is at your house with this fun craft. Handprint cherry tree from About Family Crafts. Make a cherry tree in honor of President’s Day. Winter scrape painting with narwhae printable from Projects With Kids. This fun art technique makes this gorgeous narwhal craft extra special. Painting snowflakes with a homemade straw stamp from Artsy Momma. If there is still snow around where you live, this is a great snowy craft idea. Easy kid made bird feeder craft from Natural Beach Living. These look gorgeous and give the birds a winter treat too! Tissue paper and twig snowflake craft from Buggy and Buddy. These snowflakes would look gorgeous hanging up, and you can have snow inside even if you don’t have any outside! 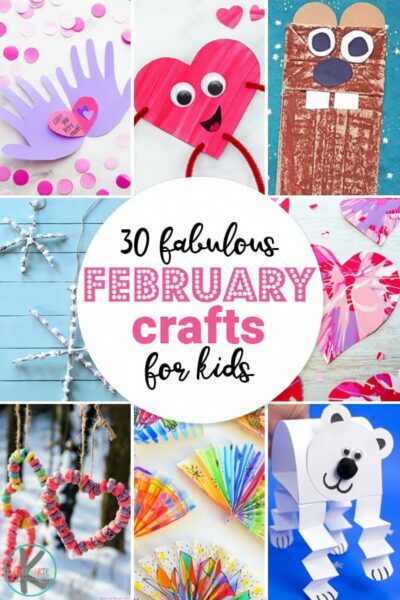 Make February a super craft month and have fun making all these fabulous February crafts for kids!